The huge, ever-growing pharmaceutical industry is full of big names, influential managers, and key administrators. 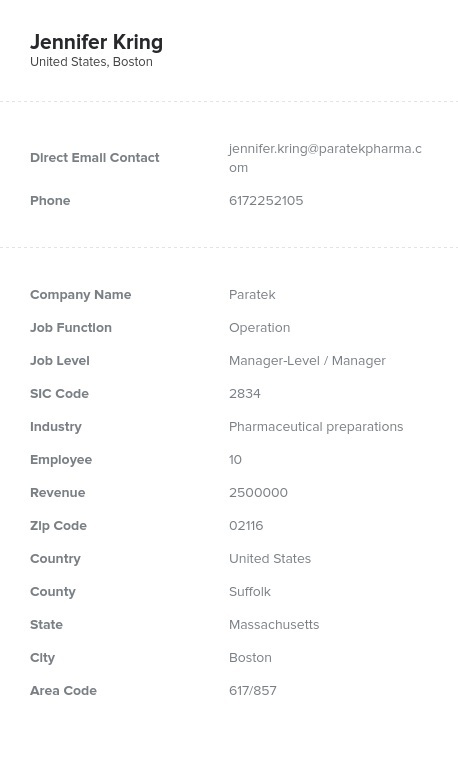 Find pharmaceutical business contacts with the help of this pre-made, ready-to-download data product from Bookyourdata.com! Contact the right people with our pharmaceutical email database now. Do you need sales-generating business-to-business (B2B) leads? Don't worry, because we have the prescription: an accurate and reliable pharmaceutical contact directory. Look up the key executives, managers, staff, administrators, and associates in the industry easily when you download this pharmaceutical email list, which contains everything from titles to phone numbers to emails to postal addresses. We have all of the sales leads you need to really start the conversation. An unsuccessful business marketing campaign can be a bitter pill to swallow. Get the right information so that you can find and talk to those who may be most interested in your product: those in the pharmaceutical industry. Whether you plan to network with this high-end group or email leads who would be interested in a new drug, service, or health-care product, you can do so more efficiently by having a consolidated, consistent contact database. Download this pharmaceutical mailing list today and you can integrate it into your CRM and get started within minutes. Start contacting the right people with this already-built product, or feel free to find another prescription for your marketing needs with our innovative list-builder tool. Our human-verified email and contact directories can help jump-start your campaign. Buy it and start making valuable contacts within the "pharma" industry now!